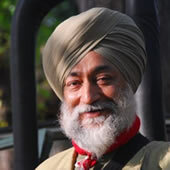 Mandip has over 40 years of expeditions, safari and exploration experience in 6 continents. He is the only Indian to be conferred the Ness Award by the Royal Geographical Society, UK. In 2012 he received the Tenzing Norgay National Adventure Award by the President of India. In 2015 he was awarded the Citation of Merit by The Explorers Club, USA. He took an Earth pledge to make a difference, after an environmental expedition in 1989 - IceWalk - in the Canadian Arctic near the North Pole, supported by the United Nations Environment Programme (UNEP). He has also been a judge for the SKAL & PATA Gold Awards and the National Tourism Awards of the Government of India. A Conservationist and a Trustee of the Himalayan Environment Trust, he has visited over 50 National Parks & Sanctuaries in India. Converted hunters into bird watching guides in North East India, tracked Snow Leopards in the Himalaya and participated in Lion captures for Radio collaring in South Africa. With knowledge of Safari operation in over 6 continents, he has written on Eco lodges in Conde Nast. Advocate of Wilderness areas and protected habitats, believes in enhancing protection of the Tiger through Ecotourism initiatives and currently working to designate the bio - diverse rich Chambal region of Central India into a World Heritage Site. He lectures worldwide on Adventure Travel & Responsible Tourism. Married to Anita Soin, the coâ€“owner of Ibex Expeditions, they have two children named after the Himalaya - Himali & Himraj. Ibex Expeditions Private Limited. Established in 1979, it is an award winning Tourism Company based in India, specializing in bespoke Adventure journeys, Eco tours, Luxury & Safari Travel. Ibex Expeditions received the Green Globe Distinction Award, PATA Gold & Discovery Awards, WTM Environmental Company Award and in 2011 the National Award for being India’s Most Innovative Company by the Ministry of Tourism, Government of India. It is also rated one of the "Best Adventure Travel Companies on Earth" by National Geographic.